- Is it possible to pass when the guy is defending like this? - Can the defend position be used for sweeps, etc.? As long as I don't have the butterfly hook with my right foot, Kari can drop to half guard. 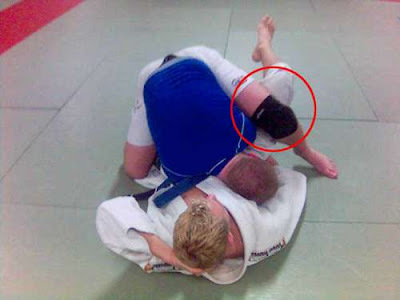 First, he turns his right arm so the elbow controls my knee. He grabs my pants by the ancle. 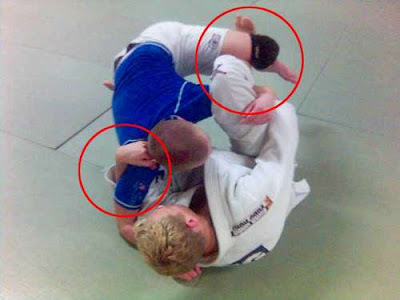 Isolates my right leg and drops to halfguard. 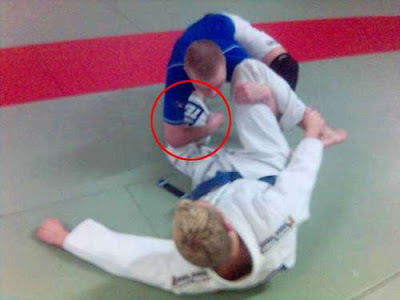 With the gi (gotta imagine that one), I can grap the sleeve. Kari attempts the drop to halfguard, but it doesn't work because of my hook. Instead he jumps all the way over and lands on my left side with his shoulder in my chest to control upperbody. Turns, pulls knee in to block guard and finish pass. 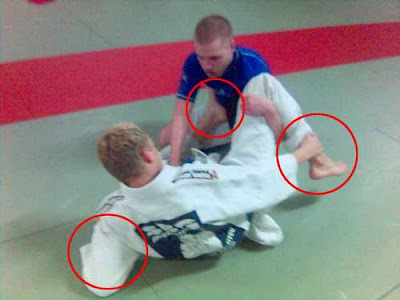 I hook with my right foot so he can't drop to halfguard. This time I pull my toes to myself to he can't jump all the way over as before without me lifting and making him roll. Instead of jumping to pass, he works his right leg up over me right knee. Hooks with the left leg and mounts. This is a simple elevator sweep from the position we worked with. First I get the butterfly hook with my right leg. Sweep seems most easy to do when I control behind the elbow. If I just lift right away, Kari can post with his right hand. If I don't already control that arm, this is exactly what I want him to do so I can get it. 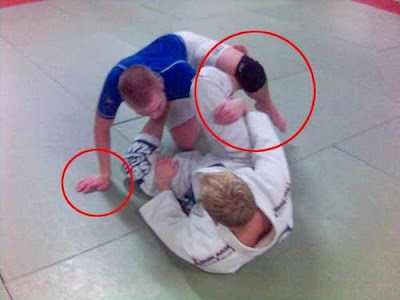 Too difficult to control by the wrist, but an underhook will do the job perfectly. ...take triangle. Pulls up his head, insert my leg. Roll and close it in.